I will set out my objective clearly: To strip Aliens of all of its credability. I want to reveal how fatally flawed it is. 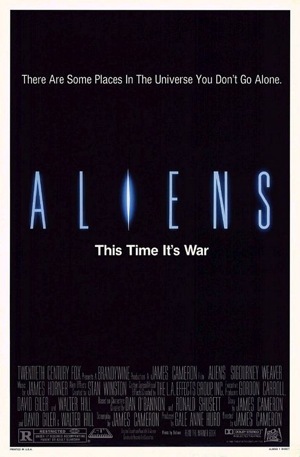 How it is appalling that so many viewers argue Aliens as the strongest in the franchise, when if we really analyse it and compare it to Alien or The Terminator, both are superior and offer unique and profound points, whilst Aliens is a rehash of previous Cameron topics – dare I say it, is Aliens a dry-run for Terminator 2: Judgement Day? Whilst, in terms of what Ridley Scott set-out in Alien, Cameron completely ripped up the rule-book and ran off on a tangent that took the franchise the wrong direction. I think Alien 3 and Alien: Resurrection are both attempting to claw back the credability of the first film … but their hands are tied behind their backs as they always try to make the film more ‘action-packed’ like the second film. In this months Empire magazine, Ridley Scott notes how he was always fascinated that none of the sequels explored the space-jockey starting-point he had set-up. A wealth of material (which he intends to use in Prometheus) was waiting for a filmmaker to capitalise on, but none of them did. It took Scott to really get back to the true starting point of the franchise. 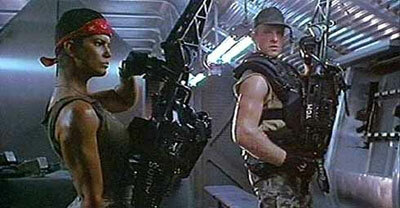 James Cameron thought “right, a sequel – we need more aliens, more guns and more military … stuff”. A clearly controversial (and debatable) starting point … and maybe a little unfair. It was unfair, I can appreciate James Cameron. I think what Aliens does clarify – and expand upon – is the clear anti-capitalist argument that was touched upon in Alien. Alien touches upon the nature of the term “crew expendable”, but this time it is about the importance of family. In fact, the very nature of a maternal role in Ripley is set-up in the very first act, as Ripley gives birth to an alien … before waking up. It is a dream. Then we are told in no uncertain terms that a substantial amount of families have lost contact … they are all dead. 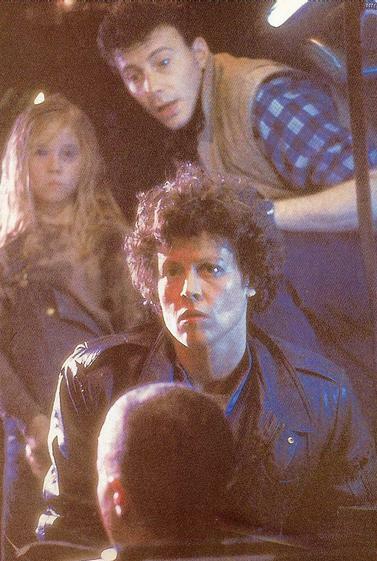 The aliens are destroying families and it is Ripley who needs to restore and create the family-unit. And she successfully does this by establishing a relationship with Cpl Dwayne Hicks (Michael Beihn), and becoming a maternal figure to Newt (Carrie Henn). Carter Burke (Paul Reiser) is the ‘Ash’ of this film. Not that Burke is a robot, but he is very much detached from his human emotions. 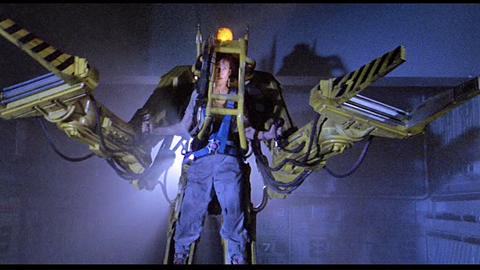 It is established early on that Burke is not to be trusted and we find out, as the film progresses, that as Ash was happy to break quarantine rules in Alien, Burke will actively release a face-hugger in the hope that it can be transported home and further experimented on. 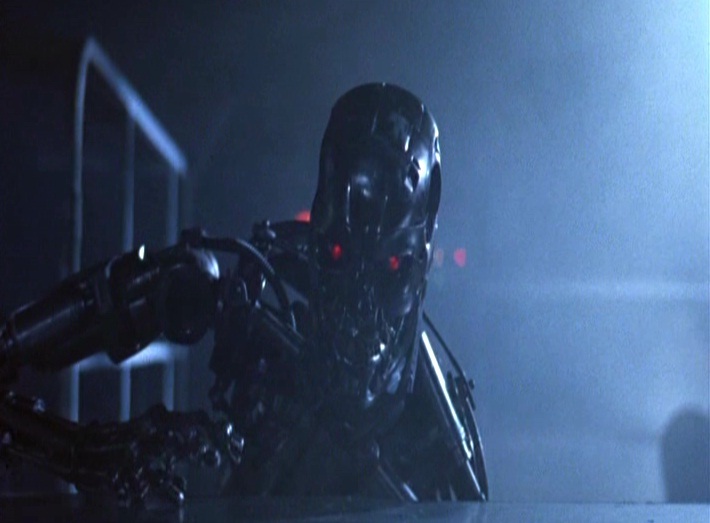 In contrast, the robot Bishop (Lance Henriksen) is played as untrustful but we see as the film progresses that his heart is in the right place. Or, a better way to put it, his circuits are running properly [insert robot-version of the phrase here]. Cameron ups-the-ante, by utilising the various alien-features to great action-effect. The acid-blood becomes a huge danger – especially for the military unit attempting to kill the aliens. The face-hugger is not just a creature that leaps on a face – we now see the tentacles flailing and slapping around, whilst we see a facehugger held back as the penetrating tube that slips down the throat is desperately trying to find its way into a humans neck. This exploration of the creatures really builds on what we know – never had we seen the creatures become so fast and dangerous. Alien is very-much about a creature killing off a crew tactically, one-by-one, whilst in Aliens it is brute force and relentless attacking. As much as I may appreciate these elements, it is very-much the old sequel-story – more aliens, more attacks, more close-ups, etc. The beauty in Alien was how we didn’t see these things – we knew about them, and were shown a dead facehugger as Ash delicately operated on it, but we didn’t see it leap around much or show-off its features. Thats not to say there was no place for it, but imagine if we had a similar small-scale story to Alien second-time round and the horror-element still played a part (opposed to turning it into action), you could still see a sequence whereby we saw a little bit more about the movement and skills of the creature – but this sequence alongside the relentless attacking of the aliens themselves just makes it a part of a mass-army attack opposed to a unique element to a subtle exploration of the aliens. Fascinating as it is, the film as a whole is built upon the idea of excess – which is completely against the subtlety of Ridley Scott’s original. 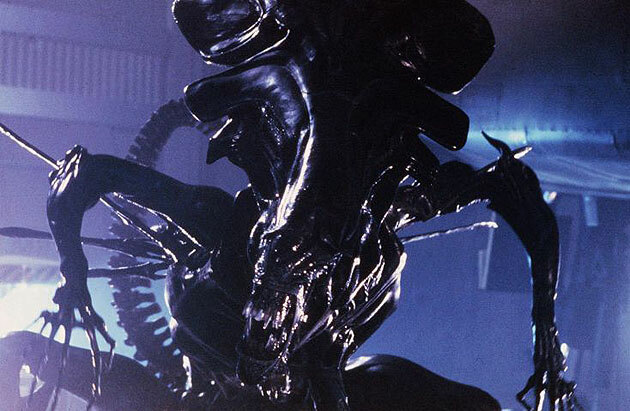 Remember, all the interesting aspects of the alien itself were set-up in the original – the only ‘new’ aspect was the Queen. Who simply looks like a queen-bee. How original. But, as a fan of Jurassic Park, I cannot help but see the clear comparison. The conflict of interest regarding company morals and ethics; is it right to experiement on creatures and play with science – and act as God (again, a theme due to come up in Prometheus). Even visually, when the aliens are at the door and when Hudson dies – both have a striking similarity to Jurassic Park. Hell, even the offices look like the Ingen company offices whilst Burkes clothing seems to be from the same shop as Dr Alan Grant. Furthermore, I think films like Aliens are what must have created and directly-inspired games such as Quake and Doom. So often we see from the point-of-view of the soldiers – often through the cameras on their heads. The relevant data appearing on the left and right, as the guns lead into the centre of the frame. Throw in the industrial and alien environment and we find ourselves in the territory of alien-shoot-em-ups Doom, Quake and – after Goldeneye – Perfect Dark. Maybe James Cameron should be in gaming-industry instead. There is one obvious echo and link to Alien when the characters run through the halls with alarms ringing out, it reminds you of the final act with Ripley in the first installment. But you can simply see how James Cameron simply took the film and franchise in a completely different direction. Even the planet LV-426, whereby the colonies live, is nothing like the spectacular, artistic creation by H.R. Giger in Alien, and I wouldn’t be suprised if this Giger-world is what Ridley Scott loved about the franchise – not the action-and-guns that became a staple of the franchise in Aliens and Alien: Resurrection. Think about Blade Runner – despite some great action-sequences, it is very much about the look of a world combined with profound and fascinating talking-points that established the film as a Sci-Fi classic. Alien, equally holds its own as it is an environment which had never been seen before combined with a creepy, horror-take of the Sci-Fi genre … the action was not important, but it became important because Jim Cameron made it so in Aliens. Simon, I see your points about Cameron and his tendency to repeat himself, but that doesn't make Aliens a weak film when taken on its own merits. Cameron isn't a subtle director, and he could never pull off what Ridley Scott did in the first movie. That's what's so great about this sequel. It shows how a different type of filmmaker handles the material. If Cameron tried to do a sequel that fit more in the horror genre, it would fail miserably. He's all about the big action scenes and the hardware, not the subtle build-up of the tension. I'm in the camp that Alien is a better film, but that doesn't mean Aliens is a failure. It's a great action movie that stands well on its own, and it can't be blamed for the failures of the 3rd and 4th movies. I wouldn't say its a weak film, but I would say that it makes ALIEN akin to the by-the-numbers-sequel rather than a sequel that rivals the first. You're right – Cameron doesn't try and 'do a ridley', but he hardly honours the tone and attitude of the first. It might as well not even be connected to the franchise! If the sequel to JURASSIC PARK was one-dinosaur on the mainland in a housing estate, everyone would be annoyed with the completely different type of film it is. And thats how I feel about ALIENS, Cameron changes the entire set-up of the franchise – and the ramifications affected the future. If were back considering a sequel to ALIEN again, I wouldn't ask Cameron to direct at all! I tend to agree with the one-alien-dynamic that Simon mentions. 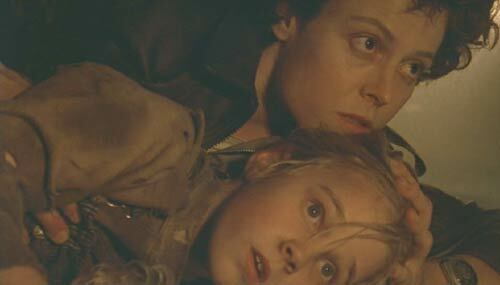 What made Alien so tense was blown up to a massive proportion in Aliens. It removes the element of fear. Thanks Colin – I think, in a very strange, but possible parrallel, it would be like the sequel of PARANORMAL ACTIVITY being more like SAW, rather than PARANORMAL ACTIVITY 2. It lost something that made the first film so good!